Jimmy Jackson is a native of Toledo and graduated from Macomber High School where he led the basketball team to the school’s first state title in 1989. He went on to Ohio State University where he set many records and led that team to two Big Ten championships. At OSU he was a three year starter (1990-92). He was Freshman of the Year in the Big Ten. Jim started all three years and played in 93 consecutive games. He was Big Ten Player of the year as a Sophomore and Junior. He was also All-American both years and led the team in scoring all three years. Jim averaged 19.2 points per game and scored 1,785 points. In 1992, he was National Player of the Year. 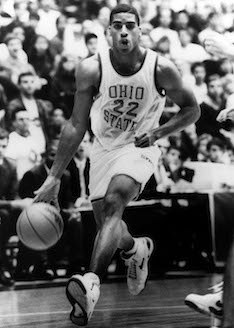 Ohio State retired his #22 jersey in 2001. Jim spent 14 seasons as a professional in the NBA, playing with several teams and was the fourth overall pick in the 1992 NBA Draft. In 1994 he scored 50 points in a game. He has passed the milestone of having scored more than 10,000 points in his professional career. Jim is proud to let his many accomplishments on the hardwood stand on their own, but more importantly, he has worked hard to give back to his home communities through grants, free basketball camps, clinics and speaking to youth groups. He has been active in the following cities in establishing business ventures to provide camps and jobs: Dallas, Denver, Columbus and Toledo. Jim has worked to use his influence and resources to create new opportunities in a variety of arenas that will contribute to bettering the quality of life for those cities, especially Toledo.